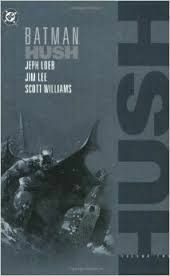 Written by Jeph Loeb; art and cover by Jim Lee and Scott Williams The 12-part "Hush" storyline - crafted by comics heavyweights Jeph Loeb and Jim Lee & Scott Williams - topped sales charts for an entire year, thrilling readers and critics alike. Now the second half of that legendary story arc - BATMAN #613-619 - is collected for the first time as a softcover in BATMAN: HUSH Volume 2. This volume contains the stunning conclusion of "Hush" featuring the Dark Knight's shocking showdown with the Joker, the debut of a brand-new Batmobile, a catfight among Catwoman, Talia and Lady Shiva, and, perhaps, most surprising of all, the true identity of the enigmatic Hush! Plus, this collection includes the 6-page story from Wizard #0 and features a stunning new cover by Lee & Williams!